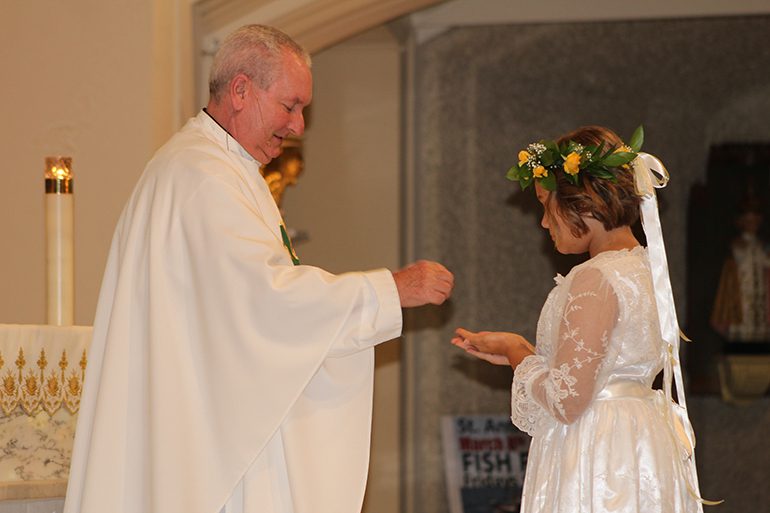 Father Michel Grady, pastor of St. Anthony Parish in Fort Lauderdale, distributes the Eucharist to Sophia Oberhelman, 10. 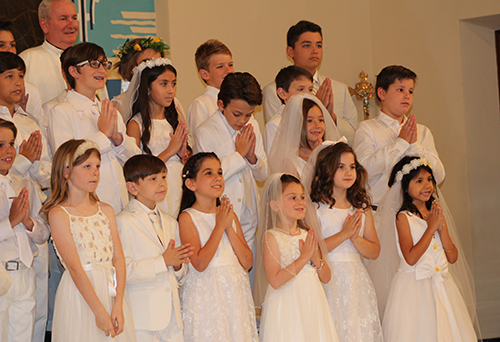 FORT LAUDERDALE | First Communion Mass was a big affair this month at St. Anthony Parish, with parents, parishioners and members of the women’s guild looking on as children received the body of Christ for the first time. 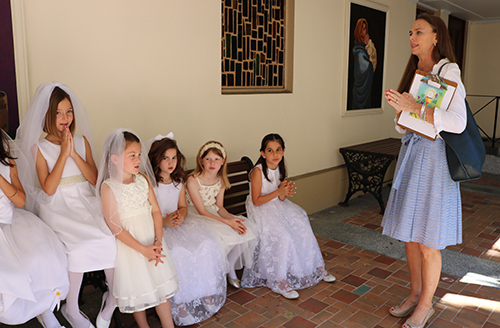 Father Michael Grady, pastor of St. Anthony Parish, gathers with children after they received their first Communion May 2 at the Fort Lauderdale church. 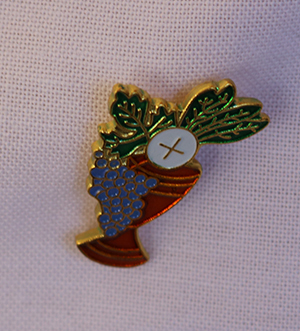 Boys wear pins featuring a chalice and host on the day they receive their first Communion at St. Anthony Church in Fort Lauderdale. The pins were given to them as gifts by the parish women's guild. 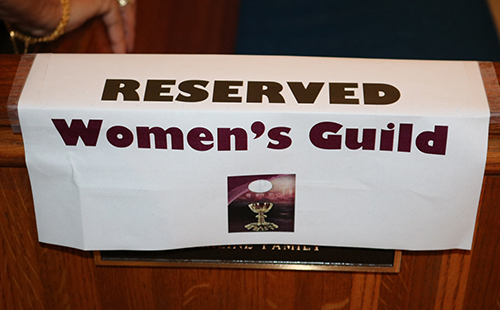 A sign marks a pew reserved for members of the St. Anthony Women's Guild. St. Anthony catechist Dot Bevins talks to young girls moments before the start of the Mass where they received their first Communion. A total of 26 children from the parish religious education program received their first Communion at the packed noon Mass March 2. That followed an earlier morning Mass for 39 first Communion students from St. Anthony School. Catechist Dot Bevins continued to prepare the religious education students —asking them questions and making sure they were familiar with what to do and what not to do — up until the moment when the parish choir began to sing and the youngsters processed down the center aisle, taking seats in front pews. Also sitting in a front pew was Patricia Solenski, director of religious education, and members of the St. Anthony Women’s Guild. The group of nearly 40 women have been praying for the children as the little ones walked on their journeys of deeper faith. Solenski came up with the prayer project. She presented it to the women’s guild and they welcomed the idea. “It is all about connecting the parish at large with the children,” said Solenski, who was worked in religious education at the parish for nearly 40 years. The guild members did not know the children at the center of their prayer until meeting them just a few days before the big celebration. “I told my child that I was proud of him,” said Pat Provenzano, who was praying for Brian Luya. Marilyn Black, another guild member, arrived early for the midday Mass. She was excited to see her child dressed in white coat and tie. He wore a small pin, a gift from the guild that featured a picture of a host and chalice. “He is a real sweet boy,” she said. At the end of Mass, the children posed for photos at the altar, and then, in the spirit of community, everyone chatted and socialized. Some of the guild members presented their children with small gifts. Indeed, it’s another step in their life journey with the community of believers. 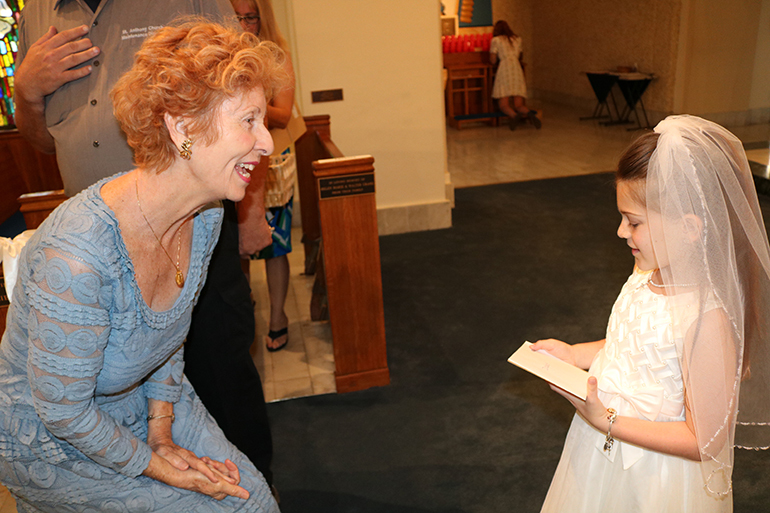 Dolores McDiarmid of St. Anthony Parish greets Delaney Lefka, the first communicant who had been at the center of her prayers over the past months.